Brooke Treadwell is the Grants Officer for the Performing Arts Program at the William and Flora Hewlett Foundation. She is responsible for grantmaking operations, practices and data analysis for the full Performing Arts portfolio, including the Hewlett 50 Arts Commissions, arts education, arts infrastructure and continuity and engagement grants. Brooke has over 15 years of experience in the nonprofit sector, working most recently at UNESCO, where she implemented education policy reforms in Myanmar. Prior to that she was senior associate at the DeBoer Foundation where she managed a portfolio of grants supporting education and global development projects. Other previous roles include program officer at World Education and associate instructor at Indiana University. 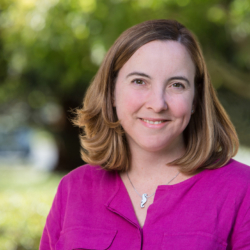 Brooke holds a bachelor’s degree in international development, a master’s degree in international and comparative education and a Ph.D. in education policy. She lives in the East Bay with her husband and son.